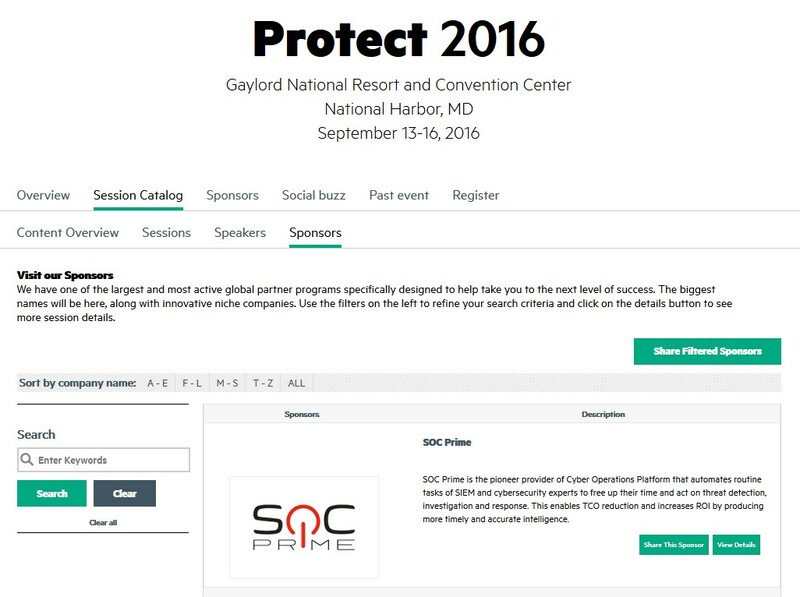 To continue and boost our strategic cooperation with HPE, SOC Prime is sponsoring Protect 2016. This means that our team of experts will not only be present on the floor but will also have a dedicated booth where you can come to get the latest news on the automation and integration of ArcSight installations. Don’t miss the chance to try our products and experience their effectiveness for yourself. Protect 2016 is HPE’s annual conference and is the place to meet the world’s top information security talent, discuss new products and share information. Come by our booth, talk to experts, see our products. We also have a breakout session coming up, stay tuned for more updates. If you want to schedule a meeting please contact us sales@socprime.com and see you at Protect 2016!